Lifehacker is a pretty big site, part of a network of pretty big sites, and as a consequence their posts get quite a bit of traffic. As an extension, the sites they link to also tend to get quite a bit of traffic. One blogger reported a single unexpected link from Lifehacker got him 14,625 visitors over the course of a day, traffic that tapered off but never fully died months afterwards. The case study in the above link isn’t all that helpful if you’re looking to mimic his success. He was, for all practical purposes, randomly discovered one day. However, his process gives you one idea of how to proceed, which you can build up and expand. 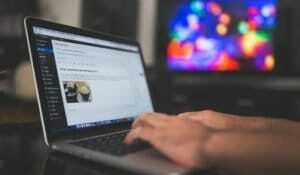 I’ve researched Lifehacker specifically for this post, to give you a handful of different methods of getting your content featured on the site. The first thing you want to do with Lifehacker, or with any other major site you want to guest post for, is research the kind of content they publish on their site. It does you no good to produce content that doesn’t fit the site and submit it anyways. For example, you wouldn’t want to send something to Jalopnik that isn’t about vehicles. 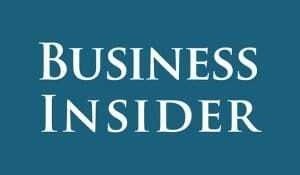 You wouldn’t send something to Business Insider that has nothing to do with business. Lifehacker publishes life and self improvement content primarily, though this is a very large spectrum. Lifehacker themselves wrote a post about how to write a post for their site, in terms of a style guide. Here’s what they have to say. Your content should have a step-by-step style. Lifehacker isn’t a site for broad, general tips like “learn how to manage your time.” That, rather, would be the focus of an entire article, with detailed steps on how to pick up time management and make sure you’re effectively moving forward. Lifehacker posts are all about how to get things done, often in a novel and interesting way, and that means providing actual, actionable steps a user can follow to achieve success with the topic you’re covering. Include nicely cropped, focused images. You don’t have a lot of space in an image in a typical Lifehacker post, so you need to crop them down aggressively. Show just enough that the user can make use of the image, but not so much that it’s confusing, overly small, or worthless. Keep in mind how layout will wrap around smaller images or be divided by larger images. Start your post with a bang. The lede – the intro sentences to each Lifehacker post – sums up the topic as briefly and succinctly as possible. This is typically two sentences; one introducing the general topic and one introducing what the post is doing with it. “Time management is the crux of a productive and profitable self-owned business. Here’s how I make the most of my time.” It’s short, simple, introduces the topic, and tells the reader exactly what they can expect. And, of course, your post needs to be high quality content with value embedded throughout, to make sure people see it, like it, and share it. This is the method the blogger from the intro used, unwittingly, to get their feature on Lifehacker. It’s inconsistent, it’s unreliable, and it’s not actually your content or your name featured on Lifehacker itself. Rather, what you’re getting here is a link to your content on your own site, from some Lifehacker piece written by one of their existing authors. The general process here is pretty simple and, like all content marketing, starts with writing good content. Take your time and write the sort of content Lifehacker would like; the life hacks, the home improvements, the self improvements, and so forth. Pick narrow topics, go into detail, provide actionable steps, document everything. Next, add to these posts references to Lifehacker content, or content written by Lifehacker authors on non-Lifehacker sites. Often these bloggers have their own sites, and linking to them is an appeal to the ego. They like being linked to the same way you do, and for the same reasons; it shows they’re producing sharable content, that they’re appreciated, and that their presence is growing. 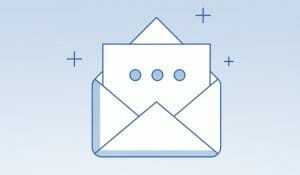 Once you publish the content, send a message to the people you referenced and notify them of that publication. You can do this via email, via website contact, via social media, or through any other contact method you have to reach them. Don’t beg for anything in return; in fact, don’t acknowledge anything more than the fact that you referenced their content in yours, and that as a consequence they might be interested in reading it. The blogger from the intro didn’t get the piece they published featured on Lifehacker this way. Rather, it was another piece of content on their site that was featured. This is because the Lifehacker author in question poked around his site and read up on some of his content. So, make sure that your site design facilitates and promotes other pieces of content on your site. That’s it. That’s the process. See why it’s unreliable? You aren’t going to reliably get your content featured, because most of your notifications will be ignored, and many of the ones that aren’t will simply result in a pageview or two. There’s no guarantee that the writer over at Lifehacker will like your content, or that it will fit in with the content they’re producing. You’re going to end up with a fairly low conversion rate for these sorts of links. On the other hand, this method may sound familiar to you. If so, it should; it’s influencer marketing. This strategy is exactly the same for getting featured on any major site. Identify influencers, reference their content, notify them, and hope they reciprocate. Lifehacker actually has a handful of different ways you can get your content onto their site. The first is the general “citizen’s tip.” It’s sort of like having an idea of a crime happening, something like drug dealers, and tipping off the police. They aren’t obliged to investigate or do anything about it, but your tip can lead to something happening. In this case, your tip won’t likely be about drug deals – unless that’s the topic of your post – but it will go to the inbox of the Lifehacker contributors, who can take a look at it and decide if it’s something they want to reference or feature. It might inspire a whole piece, or it might slot in to an existing piece, or it might just fall short of the mark. The way you can utilize this for your own content is to, well, produce content worth being a tip. Think about it as if you’re sending a casual press release to Lifehacker about your Lifehacker-styled content on your own site. Simply send that content with a short summary to tips@lifehacker.com. The second major method is for actual guest post submissions, which is probably what you’re here for in the first place. Again, you need to produce lengthy, valuable how-to content according to the content guidelines I wrote up above. 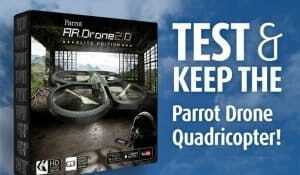 This will be content you wouldn’t mind seeing on Lifehacker as a published post. Make sure it meets all of the content guidelines, and that it’s not published somewhere else on the web. Lifehacker isn’t going to publish duplicate content, and you can bet they’re going to check. To get your content published in the form of a guest post, all you need to do is send it along with a pitch to submissions@lifehacker.com. Rather than going to a general pool or to a specific contributor, these submissions go to the head editor, who can then determine if your content fits with their content strategy. If it does, they’ll publish it and notify you. There are also tertiary ways to get your content featured. You can ask questions that can be featured and answered in the Ask Lifehacker series or the What’s Your Problem series – assuming those are still active – by sending your message to either tips+asklh or tips+wyp@lifehacker.com. You can also offer suggestions and tips for Hive Five through tips+hivefive@lifehacker.com. This third method is a bit of a roundabout way to get picked up by Lifehacker, but it’s sort of a combination of the first method and the fourth, which we haven’t gotten to quite yet. Think about all of the work you do for your own blog. How would you like to do that for a site that doesn’t hugely benefit you, and can only give you a minor bump in reputation until such time as Lifehacker takes notice of you and decides to promote your content? That’s what Kinja is. Kinja is a blogging platform set up to accompany profiles created on Lifehacker, Deadspin, Jalopnik, and the other Gizmodo blogs. If, by the way, you haven’t kept up on news about this whole situation, Gawker media lost their legal fight against Hulk Hogan and were subsequently purchased by Univision. Univision immediately retired Gawker, but kept the other blogs in the network, renaming the division the Gizmodo Media Group. 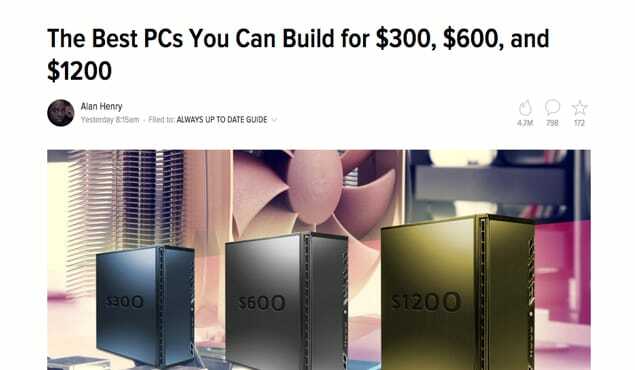 Getting your content on Lifehacker is getting it on one of the Gizmodo blogs. Kinja is a blogging platform created by the owners of Gawker back in 2004, which was expanded to the various Gawker sites in 2013. When you register to be a commenter on Lifehacker or one of those other sites, you automatically get an account with Kinja, which allows you to use the platform as your own personal blog. Think of it sort of like a combination of Tumblr and WordPress.com hosted blogs. Your site is on Kinja, it’s not open for your customization, and it’s not very expansive. However, it has one notable benefit, which is being part of a community centered around Lifehacker and their sister sites. If you’ve commented on one of those sites before, in fact, your comments show up in your Kinja feed. When writing for Kinja, you should treat it like a smaller scale version of Lifehacker itself. Write the sort of content you want to produce for their site, that will benefit both their audience and your brand. Keep your Kinja blog active, with short but valuable content, and show that you’re producing the sort of content Lifehacker readers want to see. You can also add tags for certain Lifehacker columns, like How I Work, which lets you gain exposure among the Lifehacker audience. Essentially, what you’re doing here is writing content in a place that Lifehacker can see and access. Think of it like being in a first pick position when the Lifehacker writers come looking for inspiration. You can also use it as a gateway to get into the Hackerspace Kinja blog, which is run as a sort of user-created Lifehacker auxiliary blog. 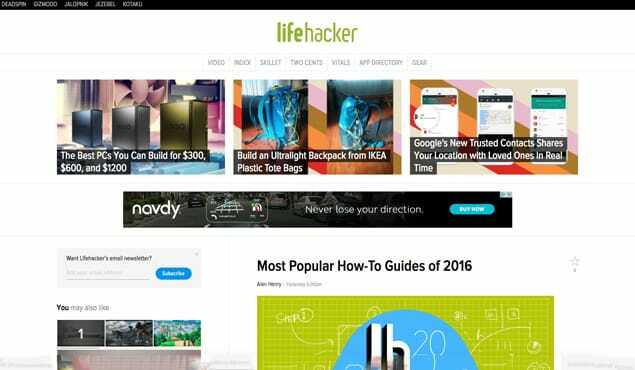 Getting your content featured on Kinja or Hackerspace will get you an in with the Lifehacker writers, and can get your content featured on the main site later. This final method is to simply apply for a real writer position on Lifehacker. This is, obviously, more of a commitment than you might want if you’re just looking for guest posts. It’s also not always open. 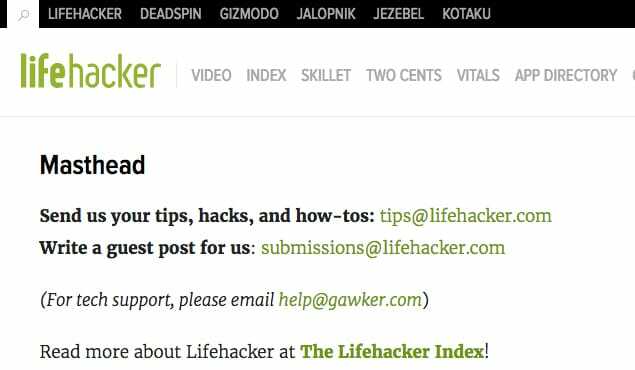 In fact, the last time Lifehacker put out a public call for new writers was in 2014. Since then, they have subsisted primarily on tip submissions and their own staff of writers. Obviously, to be a Lifehacker writer, you need to be capable of putting out a lot of content that suits their criteria. When they take on new writers, they do so on a trial basis, but even that trial basis often involves several posts per day. On the plus side, at least you’re paid if you get that far. If you want to apply, you need to compose an email with a list of reasons why you’d be a great fit, and a list if links to Lifehacker-style content you’ve produced and published elsewhere. No attachments are allowed. Send the message to jobs@lifehacker.com.